SIEGEN, Germany--(BUSINESS WIRE)--pmdtechnologies ag and BYTON, the premium intelligent electric vehicle brand, announced that pmdtechnologies ag’s 3D Time-of-Flight sensors will be used for the in-car gesture control camera system operating the 48-inch Shared Experience Display (SED) in BYTON’s first production model, the M-Byte SUV. 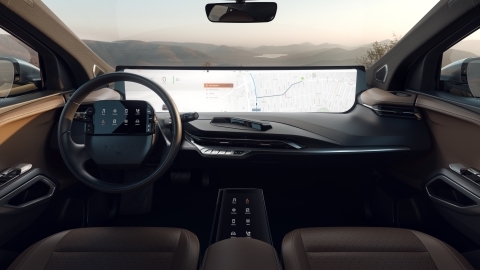 Positioned as the next generation smart device, BYTON’s product line integrates advanced digital technologies to offer customers a smart, safe, comfortable, and eco-friendly driving and mobility experience. The M-Byte is the first vehicle from BYTON, a mid-sized electric SUV that will start production in late 2019 with a design and technology platform that reflects the company’s global footprint. “As cars get more and more functions, natural interactions are becoming an important tool to simplify the human-machine interface. Byton is one of the most innovative players in the field, so the partnership is exciting for pmd as we can showcase the potential of our unique 3D approach including full sunlight, which is difficult for other 3D technologies,” said Dr. Bernd Buxbaum, CEO of pmdtechnologies ag. “Byton is changing the way consumers interact with an automobile and I am proud that our technology is a part of the M-Byte,” he added. pmdtechnologies ag’s 3D Time-of-Flight (ToF) sensors which have been jointly developed with Infineon Technologies AG are already used in smartphones, robots, VR/AR headsets and now automobiles. In Byton’s M-Byte, ToF sensors enable a car passenger to use a hand gesture to answer a smartphone or to turn on their favorite music via the SED. The pmd 3D ToF sensor has a set of illuminators at the top of M-Byte’s Camera, which continuously emits invisible light into the car cockpit. The ToF sensor measures the time it takes for the camera light to bounce back from objects and persons, whether they are stationary or moving enabling the in-car gesture control camera system. BYTON aspires to build premium intelligent electric vehicles for the future. Its crafted cars integrate advanced digital technologies to offer customers a smart, safe, comfortable and eco-friendly driving and mobility experience. BYTON aims to create a premium brand rooted in China with global reach, via a network of highly integrated offices. BYTON is headquartered in Nanjing, China, which is also home to its intelligent manufacturing base and one of several major R&D centers around the world. Its North American headquarters in Silicon Valley is focused on developing cutting-edge technologies for applications across the intelligent car user experience and autonomous driving, as well as on developing and managing North American operations. A European R&D center is based in Munich, Germany, and is responsible for designing prototype and concept model. BYTON also has offices in Beijing, Shanghai and Hong Kong, which oversee external affairs, marketing, sales, design and investor relations. pmdtechnologies ag, a fabless IC company headquartered in Siegen/Germany with subsidiaries in USA, China and Korea, is the worldwide leading 3D Time-of-Flight CMOS-based digital imaging technology supplier. Started up in 2002, the company owns over 350 worldwide patents concerning pmd-based applications, the pmd measurement principle and its realization. Addressed markets for pmd's 3D sensors are industrial automation, automotive and the wide field of consumer applications like AR/VR. Further information is available at www.pmdtec.com.